More than 10,000 runners and walkers are expected for the 26th Fifth Third Turkey Trot on Thanksgiving morning in Detroit. The field has grown 100% the past four years, in part because of its connection to America's Thanksgiving Parade. Each year, the event has more of the look and feel of being part of the parade. The "tradition before the tradition" is giving way to the "parade before the parade." Costumed runners always have been part of the event. Now organizers (full disclosure: I'm the race director!) are advertising to runners to rent costumes from The Parade Company or just join the costume corral at the front of the field at the starting line. As trotters enter the registration room at Cobo Center on Wednesday afternoon or Thursday morning, they will be greeted by a mini-menagerie of parade props, including inflatable turkeys and papier-mâché "big heads." Registrants are encouraged to avoid the crush by picking up their bib numbers, timing tags and shirts early. They also can speed up the process by waiting until after the race to get their shirts, or dropping them off at the baggage-claim area without racing back to their cars. Gone are the sweatshirts and cartoon turkey logos. There will be a new, stylish design on a technical shirt this year. Gone are the timing chips that had to be removed at the finish line. The new disposable tags will let runners cruise straight to the new food court. Gone are the tables of token food items. Runners can circle through a food court with a number of choices, such as Clif Shot Bloks, Snyder's pretzels, Detroit Popcorn Company popcorn and the staples of fresh bagels and bananas. 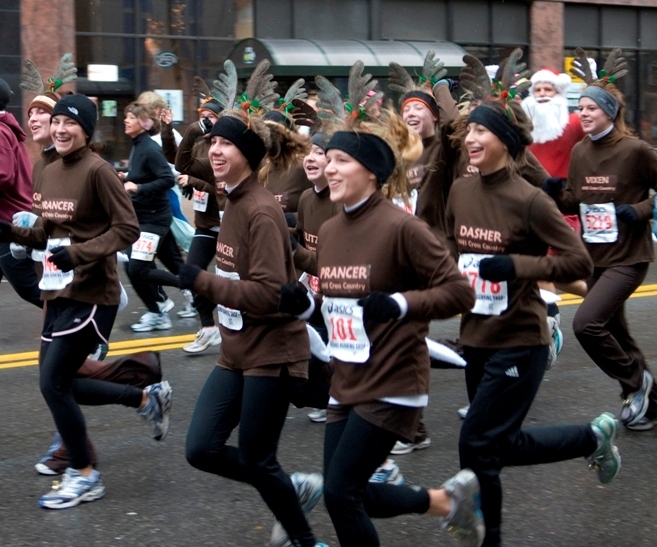 The Fifth Third Turkey Trot kicks off at 7:15 a.m. with a celebrity-judged costume contest. Wally Triplett, the former Lions halfback and the first African American to play in the NFL after being drafted into the league, will be on hand. He also will assist Jack Riley, marketing vice president for Fifth Third Bank, in starting the main events. The Mash Potato Mile begins at 7:30 a.m. with a new course. Kids will start on Washington Avenue, in front of Cobo Center, and circle the waterfront behind Cobo and Joe Louis Arena. The Turkey Trot 10K and Stuffing Strut 5K also have new courses. Woodward Avenue, from Congress to Jefferson, will be full of runners. WDIV-TV Local 4, the Free Press' reporting partner, will televise the start, when runners and walkers will make their way along the parade route and in front of the largest spectator crowd of any race in Michigan. This year, everyone will make the first turnaround together. Course marshals will be shouting for runners to keep to the right as they head back to Cobo. Larned Street will become the split as the 5K runners head to the finish while the 10K runners continue out to Chene Park before running along the riverfront. The top 100 men and women will receive scarves to match past year’s wool caps. The rest will be encouraged to hustle back to Woodward to catch the Parade in the designated runner bleacher seats. Doug Kurtis can be reached by clicking here! First time running this "race" today, so I can't speak to improvements. I was amazed to read tonight that there were just 4,000 participants 6 years ago and over 10,000 today. Which is GREAT for the city, but with so many walkers, it made for really slow going. This race has reached the point where it's time to start corralling runners by pace at the start and figure out how to handle all those walkers. Otherwise, get rid of the chips and call it a fun-run. Because unless you started at the front of the pack, it would have been tough to set a PR today. So, while it was a fun event, I didn't really enjoy my run, if that makes sense. Also, it seems organizers didn't anticipate the traffic gridlock that prevented some runners from getting there in time to register and caused me to spend an hour getting off the roof at Cobo after the run. Next year...shuttles from off-site parking, and no race-day registration? The results are incorrect! I ran 55 min according to my stop watch and i see that my time shows 1 hour. I guess the chip did not work. Anyone else have this problem? I disagree with some of Spinnerpom's suggested changes like getting rid of the timing chips, corralling runners, or canceling race-day registration. Please don't do any of these things -- most people understand that it's a fun run when they see all the costumed runners, and those trying to set a PR should place themselves near the front of the pack. Also, I wouldn't blame the organizers for not anticipating the gridlock which caused some people to be late, I'd blame the late arrivals themselves. Finally, the Turkey Trot had less than 5900 finishers according to the official race results on this site. If the 10,000-runner estimate is accurate, then it's a combination of all three races (and therefore somewhat misleading). My time is incorrect too. It looks like the finish time is posted and not actual running time. We should be credited for our chip time, otherwise why bother to wear timing chip? Took me minutes before I get to the starting line. I was fine because I picked my packet up the day before and arrived quite early. Perhaps it would be good if the race website listed alternate parking options and encourage people to allow enough time. I feel for the folks who weren't able to park, I really do, and I certainly didn't want to spend nearly an hour getting out of the city when I had dinner to cook! I'm not blaming the organizers for the gridlock, just for not warning folks that parking might be an issue. So next year I'll go into this with a "fun run" mindset (especially since the chip times don't reflect my actual start time) or make sure I'm positioned at the front of the pack for the start. My time is also incorrect. It reflects the time I crossed the finish line from the time the race started not when I crossed the starting line. I don't see a point in the chips if that is the case. Very disappointing. Otherwise, it was a good race. I have mixed emotions about the size. Great to see so many people out running, but the start was very crowded. I agree- if there is going to be such a long wait for food at least have water readily available. They could try putting water at the finish line instead of inside. Also, the food court is really not a good idea with the volumes of people running. A great day and a great race! However, will we ever know our correct times? No one at Gault Management will give me an answer. They should at least tell us what went wrong. My 4th time running the race and the worst I've seen this run organized. I've never really had complaints about this run in the past (besides trying not to get stuck behind slow walkers while you are running) but this year I had quite a few. 1. Easily my biggest complaint was that my time was incorrect as well as for the rest of the group that I went down to run the race with. I've never had issues with my official time before and since this race didn't factor in when I actually crossed the start line I can only guess at what time I actually ran. 2. The road to Cobo was blocked before the race so you couldn't get there for the cheap parking and then when the race was starting the road was opened back up and so as you made your way to the start of the race you had to cut across traffic. The street should have just remained closed the entire time. 3. Post race snacks took forever to actually get since their setup for it was horrible. It was practically impossible to get to the food and then to leave from it since you had to make your way back through a wall of people. 4. Online registration closed almost a week before the race. Most sites you can still register online the day before the race. We ended up driving to Detroit the day before to register just to make sure we would get shirts, which were really nice this year and so were the sweatshirts from last year. 5. The same guy who always wears the same costume won the costume contest again. His costume is good, but I think it would be better for a kid to get the award rather than just handing him it year after year. But at least this year they hadn't already announced the winners before the contest judging was listed to begin. I still enjoyed myself and I'll probably end up running it next year too, I was just rather surprised this year how poorly things were run since they've always done a really good job in the past. My watch time does not match the official time - difference of 8 minutes which is what the start clock said when I crossed the start line. I think gun times were recorded and not chip times. Two other runners I know ran the entire race together and both have completely different "official" times. Well, it seems that they had a chip finish, not a chip start. Maybe they had some sort of malfunction, since there was a chip timing mat or wathever they call it at the starting line. My time was off by about 5 seconds and thats how long it took me to cross the start. This year they had a much better course set up. And I agree about the food part, very congested. Overall I think it was much better than last year. I was also surprised at the amount of runners/walkers. My 12 year old son and I were separated at the end of the race for some time due to the large crowds. My son's chip time was correct but mine was not. I emailed the Gault Management and they used my son's start time to give me more accurate chip time. We really enjoyed the bleacher seats that we purchased to watch the parade. Even Mother Nature cooperated this year. Overall, even though I did not come close to my PR time, it was a pretty good race! Three of the five people in our group also had gun times rather than chip times. Two of us were more than 12 minutes back which makes a REALLY big difference! This is our second race using the new disposable chip and in both cases our times were incorrect with no explanation from Gault Race Management (Crim 10 Miler in August was the first). We're not speedy or going to take home any hardware but if you are going to post times, we do like to get the proper credit for our efforts. This was my second time running this particular race. Th gun time and chip time for my race was more than 10 minutes incorrect. I also agree with other people that the end of the race corral area was poorly constucted. I didn't even see were food was being offered. My feeling is that more thought and planning should be devouted to make next year's race run smoother. I think I will forgo the race in Detroit next year and try the Turkey Trot in A2. My hope is that it will be better organized. If your chip time was wrong you should email Gault Mgt at GRaceMgt@aol.com. I was a first timer and was disappointed to see my time was wrong. Instead of coming on a forum and complaining my time was incorrect I emailed them. They said that one of the readers malfunctioned (potentially not their fault) and they corrected my time. If you were running with someone let them know who as that will help identifying your time. I’d like to thank everyone for writing; positive or negative. I appreciate that you care enough to write. We were amazed by this year’s turn out. We’ve had steady growth for four years now. This year we had a 21% growth in finishers. The Fifth Third Turkey Trot is one of the nation’s top 100 and top ten 10km events with timed finishers. We hope our growth comes in part from trying to create a parade like experience and something that is fun for the whole family. We now have 25 staff members and almost 200 volunteers (no easy task on Thanksgiving Day) that work to make this race a success. This year we tried quite a few new things. From the new course, new starting area, timing tags, tech shirts and women’s sizes to increased parking was all done to encourage people to come to Detroit and run or walk. FYI: The volunteer big heads said they had a blast. I apologize for the layout of the food court. What I envisioned just didn’t work. We were trying to offer a much larger variety of food but the layout wasn’t right. You’ll see a significant difference next year. As said in a previous note, there was a timing malfunction that caused some problems. Gault Race Management has been a wonderful company to work with and will do their best to fix your times. We understand that for some of you, your time is important. Just five years ago only the top 500 were timed. Better yet, next year we’d like to see all of you in costume making this the parade before the parade. As a volunteer for the Turkey Trot I would like to comment. It's a great cause and I'm sure I'll help out again, but it's very disheartening to have greedy, impatient runners yelling at you about petty issues. Everyone is doing the best they can. If you thanked a volunteer lately, good for you. If you yelled at a volunteer lately, shame on you! Doug, thanks for the clarification. Although others may disagree with me, I think at least starting the runners before the walkers would be a great idea. I've done other 5k/10k/walk events and the runners are always well ahead of the walkers. The "Race for the Cure" in Detroit is a great example...HUGE event, and not once did I have to slow down for or weave through a group of walkers. This might require rethinking the location of the start, but I think it would make for a better experience for both the runners and the walkers. I've spoken to several friends who walked it and they found it disconcerting to have runners weaving in and out of the crowd, so staggering the start would benefit everyone concerned. As a first time runner, I had a great time. However, I ran with 2 others, and we all have different times, according to the website - I found this very disappointing. Also, it would have been nice to be warned that traffic is gridlocked, and we could expect to sit on Jefferson for an hour. Thanks Doug for acknowledging the issues. I was very frustrated that I could not at least get water after running 6.2 miles. Dexter-Ann Arbor does a great job with the food tables (although fewer people do run). It would be great if an acknowlegement could be sent out via email about the chip times. Otherwise, better course than in past years. Can we have staggered starts with the 5k and 10K runs? This would create less congestion at the start line. This was my first time running this 10k and I had a blast. Yes, the lines were long and it took a while to get to the parking, food, etc. Seriously though, if you expected something less I fear you're a little delusional. These races run on mostly the effort s of a short staffed group of hard working volunteers. Give ‘em a break, thank them for taking time out of THEIR Thanksgiving day to help you, and enjoy yourself! The only thing that’s already been addressed to death is the timing chip snafu. Gault is paid to do this, so they should have had the start all set up and tested. We watched them setting up not more than a half hour before the race, so who knows if that affected their efforts. As a guy who’s running in the 50 min mark though, I don’t think a few minutes difference affected my dream of a top 100 status. I’ll e-mail them out of curiosity though and see what they can do. Overall, it was a great day and I’ll definitely be back to race, see the sights, freeze in some parts of the race and boil in the others and work up the best turkey appetite ever. Nice shirts too! Thanks Doug and the rest of the volunteers!!!! I am very disappointed in the timing. I don't want to pay for chip timing and have a posted time of 15 minutes slower than my watch especially since I crossed the start line at 8:16...where did those extra minutes come from. The food was out of hand. Last years set up was much better and much less congested at the end. I recommend a staggered start for runners VS walkers. I don't run it to PR, but I do run to RUN! The shirts are a great improvement. Thanks Doug and volunteers for putting on this wonderful event! I had such a good time last year that I brought my wife with me this year, it was her first 5K. I concur with the host of people calling for a staggered start. It will not only make for better run times, but it will be safer too! It's not about being able to run a PR, it's about being able to run your pace without resorting to the sidewalk or weaving in and around folks that are just out to take in the day. The shirts are awesome! I will wear it often on training runs and to other events, unlike the sweatshirt from last year. Liked the new course. T-shirts were nice with no giant advertising billboard on the back. Thanked all the great volunteers without whom we wouldn't have this race. Didn't even attempt to get at the food because of the obvious chaos. Was disappointed to see those who did greedily carry out arm loads of food. The timing chip was definitely an issue and though we did e-mail Gault, we received no clarification until the posting here. If there was a technical snafu, acknowledge it on the results site. Better yet, with so many incorrect times, just go back to the old days and post everyone's gun time. As a runner and having been a race volunteer and race director, two things runners do expect are an accurate, well marked course and accurate results - everything else is a bonus. was 1:22:06 chip time was 1:27:42 ?? The number of people is amazing, and so were some of the costumes I saw! What a fabulous event! Thank you to all involved. Began running in July and this was my first Stuffing Strut. When I heard about runners wearing costumes and then that there was to be a contest… I got into the spirit. My goal was to run a “decent” pace throughout, have silly fun, and have my grandkids see me in my Snow Goddess costume. They so enjoyed me all dressed up. What a fun group runners are. I laughed with so many people and shared many smiles. With much love & gratitude. My first Turkey Trot was 20 years ago and what a difference! Loved it both times, but this was the best. I got my 16 year old daughter to enter her first race and now she's hooked. We'll be back next year and we promise to be in costume! My thoughts relating to the basic complaints. Food, no big deal I consider it a bonus if you get something with that many people finishing at the same time. Walkers, please have them start after the runners, there were numerous walkers, walking 4 abreast in the middle of the road. Plus most of these walkers weren't the type that were out to work up anything close to a sweat. Traffic, that was a shocker and I'm glad we left the house early enough! Chip Timing, it's all been said. Thanks to everyone, I had a great time and you helped creat a new runner. Beth, why does everyone need to "calm down" -- because their opinion of the race differs from yours? Are you the Turkey Trot opinion maker? And, because YOUR goal was to have fun, doesn't make "having fun" the goal of every runner. For those with a PR goal, the timing issue is a big deal and they have every right to complain. I didn't run this race due to the large number of walkers clogging the start (know from past experience), so I could care less. Just thought it was funny how you were "scolding" those who felt differently than you. 1. With such a large field, the 5K and 10 K races should start separately. Perhaps this would solve the timing problem where many runners start time wasn't picked up, so they ended up with a gun time rather than chip to chip time. 2. The planning for the distribution of food and drinks needs to be improved. Spread it out and it will go much smoother. Overall, it was my first Turkey Trot and I'm looking forward to doing it again. My second Turkey Trot loved both and glad to hear there was a timing issue. I thought I just ran a personal worst for the year. I like being downtown parking is always an issue plan ahead. Walkers need to start somewhere else or behind the runners. The whole field making the u-turn really bogged down the turn. I loved the last 5K on down Larned and back on Atwater. The field got smaller and you could really get into your rythem. Didn't even know there was food and water I always bring my own. Cant wait till next year. But no costume for me...maybe a Santa hat. The shirts are great too. Thanks Doug. I also enjoyed the race but like everyone else my chip time was off by almost 8 minutes (very disappointing). My Garmin had a finish time of 45:20, so that's what I'm sticking with. I also agree that the race committee needs to do something about all the walkers, especially those with pets. Twice, I almost stepped on a small dog!! That's crazy!! I just wanted to leave a note for everyone reading this thread. I have run MANY races timed by Gault Race Management, and I have NEVER had a problem with my time being recorded wrong. They are a terrific company that has been efficiently timing thousands of races across the state over many years. This year's Turkey Trot must have just been an unfortunate accident, please consider it just that and join me as I run some of their other races (check out my favorite, the Great Turtle Half Marathon on Mackinaw Island! ).